How Do I Find and Start Alliance Key Manager for Encryption Key Management in AWS? 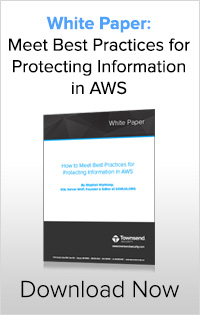 For Amazon Web Services (AWS) users, encryption and key management has never been easier. Townsend Security's Alliance Key Manager uses the same FIPS 140-2 compliant key management technology found in the company's HSM and in use by over 3,000 customers worldwide. In the AWS Marketplace, there are two entries for Alliance Key Manager – one is for the fee-based implementation and one is for the Bring Your Own License (BYOL) implementation. Both are identical in their key management functionality. If you only need one or two instances of Alliance Key Manager you can use the fee-based entry in the marketplace. If you are going to use more than a couple of instances of the key manager you may want to use the Bring Your Own License entry to launch the key manager. There are discounts available for multiple instances of Alliance Key Manager and the BYOL version may be less expensive. If you are logged into your AWS account you can directly launch Alliance Key Manager from the marketplace. Both licensing models support a free 30-day license to use the key manager. Before launching, you should determine if you want to run the key manager in the public AWS cloud, or if you want to run the key manager in a virtual private cloud (VPC). The AWS virtual private cloud platform provides more isolation from other cloud customers and therefore a bit more security, if that is desired. As you launch Alliance Key Manager in the AWS cloud you will need to select a region in which to run the key manager. Alliance Key Manager supports all of the AWS regions and you can run it anywhere. Your choice of regions may reflect your estimate of where you will have the greatest demand, or where you want critical key material to reside. Once your AWS instance of Alliance Key Manager has been launched you can open an SSH session to the key manager to perform initial set up. You will change your password, create a set of server and client PKI certificates, indicate whether this instance of the key server is a primary or secondary mirror server, and create some initial unique encryption keys. After answering these questions you will have a fully functional, dedicated EC2 instance of Alliance Key Manager ready to use. Alliance Key Manager comes with a full suite of software development kits (SDKs) and documentation, but the marketplace is limited to three documents. After you launch your AWS instance of the key manager please contact Townsend Security to register and get access to the AKM Supplemental documentation. Unless you register at the Townsend Security web site it will not be possible to contact you and send you the documentation. There is no charge for access to the documentation. The AWS license comes with customer support at the Basic level. This provides technical support and software updates via email during business hours. A Premium Support options is available that provides telephone and web support and includes 24/7/365 support for business interruption issues. Please visit the Townsend Security web site for more information about the Premium Support option and to register your instance of Alliance Key Manager for AWS. At Townsend Security we want to provide you with a positive experience with our key management products and provide you the support you deserve. When you run our Alliance Key Manager in AWS we won’t know who you are because Amazon does not report that information. By registering at the Townsend Security web site you get access to documentation, SDKs and free support. And we can keep you up to date on the latest security patches and enhancements! You can find more information about Alliance Key Manager in AWS here.